You almost know you are going to love Margot even before meeting her. Just the sight of her across the street, the beautiful old signage and quaint, skinny locale, are enough to win over anyone. Step inside to find even more charm, wood-paneled walls, holiday decorations, and photos of the tropical beaches and scenery of the home in the Dominican Republic. 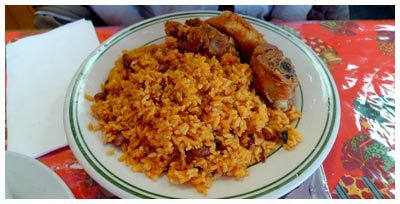 The menu is not large, focusing on all the usual staples of Dominican food, and doing it superbly. A small bowl of soup is a good way to start, either the mondongo or any sancocho would be wise. The sancocho de rabo ($6 small, below) is like other oxtail soups in that the meat is not delicious but somehow makes for an amazing soup. It's thick and full of yuca and plantains. If it happens to be lunch when you go, it's not a bad idea to peruse the lunch specials, which are your choice of entree with rice and beans or moro. One option is the pollo frito (below), an above-average rendition of a Dominican favorite. This plate is served with moro, a version of fried rice with beans, usually black. It's a good selection for the dry options on the menu, as you can eat it on its own, but will be offered gravy by the staff anyways. My favorite is the res guisada (below), a perfectly stewed beef, served with white rice and red beans. It all mixes together well and is comfort food at its best. It is obvious that I am not the only one who enjoys this place, as the owners (or maybe interior decorator?) has taken it upon themselves to hang up framed photos of happy customers and their positive notes. It all just makes the place an anchor of the neighborhood, but these locals are more than happy to welcome anyone to enjoy their fine fare.